I started Spring Cleaning Home Organization in 2013 and trained with Marie Kondo in 2018, but I’ve been organizing my entire life. I started out organizing my crayons by shade, and it just went from there! For many years I organized outdoor activities for thousands of people as the program director for an outdoor company. I also did logistic for Outward Bound, and everywhere I went I seemed to clear clutter and help with organizing. To me, organizing is much more than just putting things in their proper place – it’s discovering what truly makes us happy and letting go of things that don’t serve us any longer. This opens space around us and within ourselves to allow the things we truly love fill to our lives. The outcome is often more joy, peace and happiness. One of my great joys in life is helping people define and reach their goals ~ clearing clutter is just the beginning! I’m also the co-owner and operator of a small women’s kayak and adventure business called Journey For Purpose, in which I lead women on kayak tours from a few hours to 8 days in Belize. From a young age I found solace and adventure in the natural world. I spent my first ten years living in a log house on five wooded acres outside of Spokane, Washington. All around me from the time I was born were plants, water, sunshine, snow and animals. My parents ran a plant nursery on our property and had a large garden that supplied much of our food. We didn’t have much money, but I was rich. I played in the woods, collected frogs and worms, picked peas in the garden, played with my ducks, chickens, dog, and, well, you get the idea. I spent a lot of time barefoot with unbrushed hair. I often organized mini-expeditions into the woods with my neighbor friends and spent hours organizing my legos, stuffed animals, crayons and pens. We moved to Seattle, Washington when I was 10, then to Poulsbo, Washington when I was 11. I was a shy girl in a new place, forced to keep my shoes on and hair brushed, and around age 13, troubled teenagerhood began (read my blog post for a story about this time, with a somewhat graphic MeToo story). I spent long afternoons alone on the beach with my journal and a bottle of mixed hard liquor, taking breaks from my acting career as a soccer player, happy student and otherwise normal girl. A steady supply of stolen caffeine pills mixed with hard liquor stashes kept me going on the harder days. At age 15, I went through treatment for alcohol after an overdose, then went on a three-week Outward Bound course. I found a healthy community and rediscovered my love of being immersed in the natural world. Through deep emotional work and long afternoons alone with my journal on the shores of the Puget Sound, I again connected with the inner Spring, full of love and light. At age 19 I took a mountaineering course at Olympic College, which lead to the opportunity to lead a two-hundred mile hike along the Pacific Crest Trail in Oregon with teenagers from the Suquamish Tribe, and I got a job selling outdoor equipment at the Mountain Shoppe in Bremerton. With weekends spent climbing mountains and weekdays spent learning new subjects in school and talking with people who traveled around the world for outdoor adventures, I found the joy I’d had as a child. I decided I wanted a future being outside and surrounded by outdoorsy people as much as possible. As a student at The Evergreen State College, I learned how humans were harming the natural world and at first I was angry, depressed and frustrated. I wrote angry poems and ranted in my journal. But one day, as I drove home from shopping at Safeway, I realized it wasn’t fair for me to rant unless I was part of the solution. I soon sold my car and started riding my bike and the bus everywhere. I began eating organic food and learned about buying in bulk. I started having clothing swaps and studying people who made a difference in the world. Of course, things changed as I grew older – I bought a car, started giving in to my Cheetos cravings – but I’ve kept my values close and am still very thoughtful about my actions and purchases. 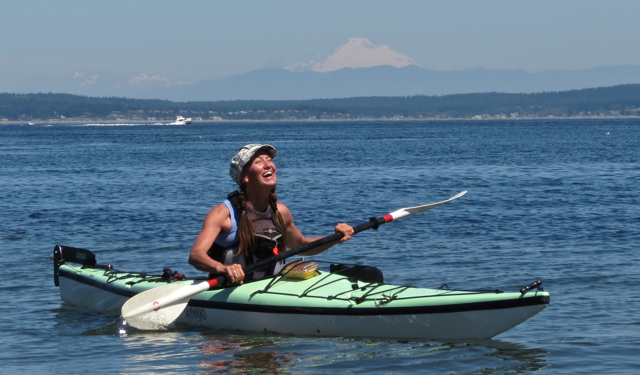 I became the program director for the Olympic Outdoor Center (OOC) on the beautiful Kitsap Peninsula in Washington, where I taught kayaking, mountain biking, standup paddleboarding, rock climbing and marine life to youth and adults. It was there that I created Outdoor Adventure Camps, my dream summer camp that combined environmental education and outdoor recreation to introduce youth to both the freedom and safety/respect guidelines for outdoor play. During a break at OOC, I worked in Seattle for my friend’s company, BabyLegs, which flew and drove me all over the U.S, England and Uganda as a salesperson and unofficial “sustainability staff.” I received my certificate in sustainable business through Pinchot University and helped get the Seattle Ski Shuttle going, then came back to my beloved OOC the Kitsap Peninsula. Now, as the owner and operator of Spring Cleaning Home Organization and co-owner of Journey For Purpose, I live a comparatively calm life and try to have as little negative impact on the natural world as possible. I continue to learn and share my experiences along the way. Kayaking on the Straits of Juan de Fuca, Mt. Baker in the background. Photo by Don Willott. Copyright © 2019 Spring Courtright. Powered by WordPress. Theme: Accelerate by ThemeGrill.